So here we are! 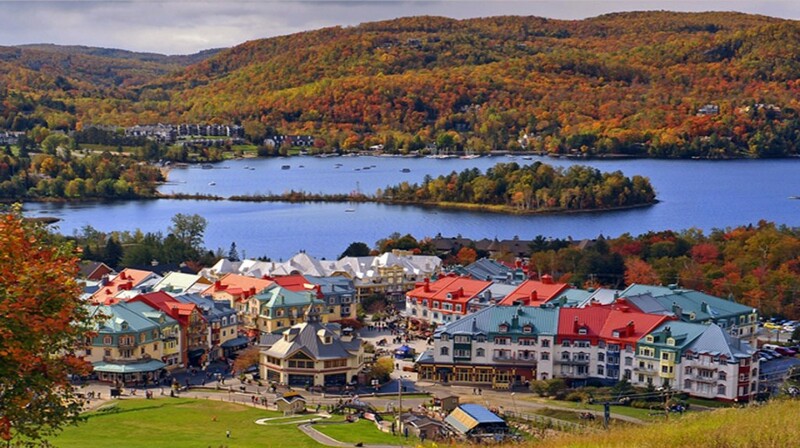 My 4th IM, 3rd time in Mont Tremblant since June, first season racing for Peak!! My 2014 season began at 70.3 Texas in Galveston – decent race with an unfortunate crash on the bike after getting cut off by a car at an intersection (seriously, during a race with a cop directing traffic!!). Finish time – 4:47, a little sluggish on the run. 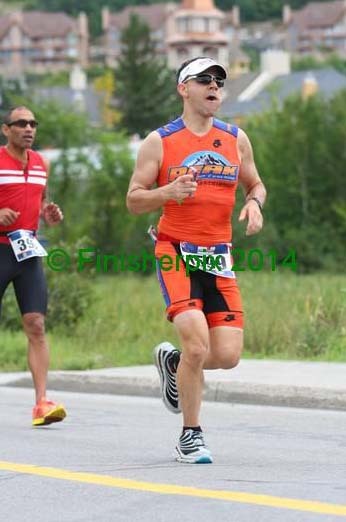 Had fun at the Nashua Sprint in June – then onto 70.3 Mont Tremblant at the end of June. 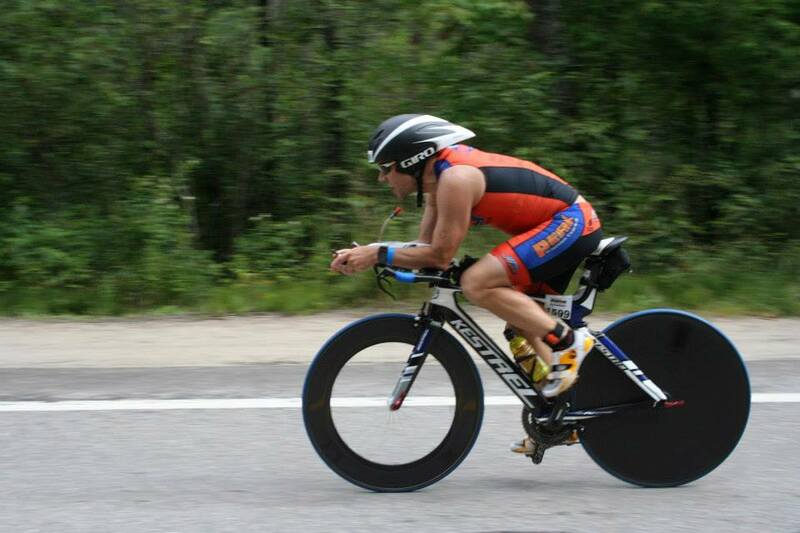 I had a great bike performance for me – 2:32, but again the run was a disappointment, finish time of 4:54. The next weekend was spent at NEMS Lake Placid camp. 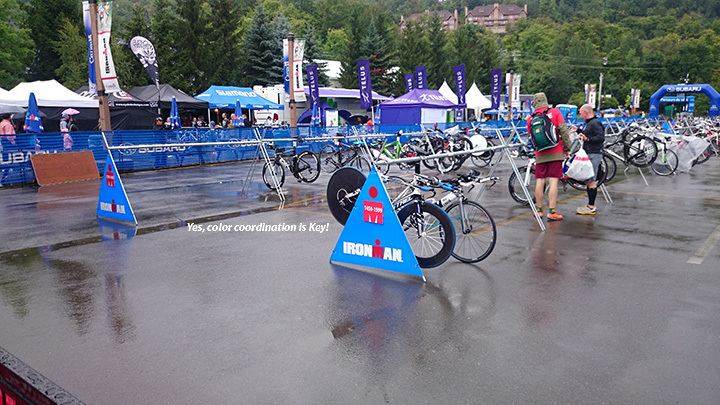 A bit of a speed brush up at Mass State Triathlon Olympic distance in July, a second NEMS camp in Mont Tremblant end of July, and back again to Mont Tremblant for the IM. I have to say, a fantastic summer – met so many great athletes, everyone keeping me motivated. Like most, arrived at Mont Tremblant Thursday before the race, had a relaxing Friday – then there was Saturday. As I was getting my bike ready, my Garmin was not picking up my power meter. In a slight panic I called coach Colin, who calmly (thanks Colin!) suggested I bring it to the race mechanics, thankfully it only needed a battery replacement. At this point I was at the transition area ready to drop off my bike, but I had to re-pair the garmin with the power meter – yeah not easy to do next to probably 1,000 other bikes with power meters. Cursing under my breath at every person getting close to me with their bike (only a little though, I mean my bike was fixed after all) I finally got far enough away – pairing success!! Bonus, my bike was at the end of a rack. Lastly, I needed a hair cut!! For future reference, make sure you have some Canadian money when getting a hair cut in Canada, didn’t have any, and they didn’t accept any kind of plastic 🙁 Imagine for yourself the next 15 minutes Trent running around looking for an ATM which are not as common as you might think. Managed to avoid getting arrested and thankfully was ready to relax. Race Morning was here – ate breakfast at 3:30, felt relaxed and ready. I headed to transition, got everything ready, and met up with several of the NEMS crew at the swim start. 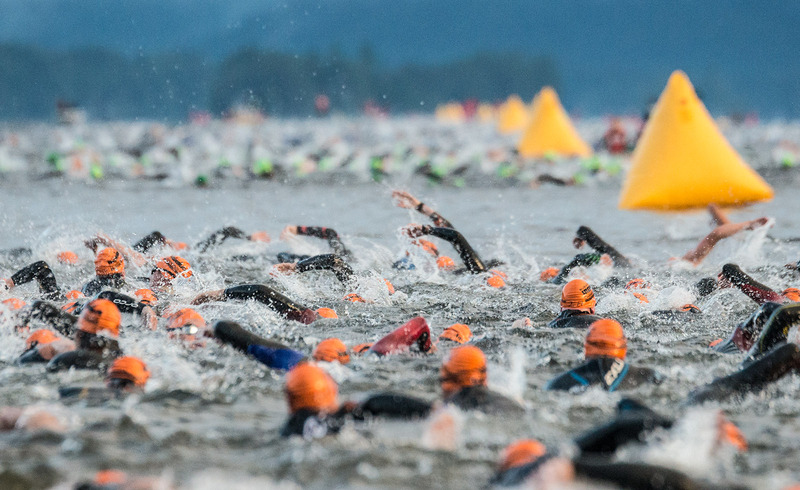 Took forever to get my wetsuit on (as usual) and headed to the start – not easy as the spectators were between me and the beach. I couple of scaled fences later and my feet were wet at the start. In my mind I’d rather avoid beach starts if possible, but hey, I just need to pick my legs up a little higher than most, so in the second wave we were off. I felt great through the entire swim, my new Roka wetsuit was amazing (highly recommended), and swam on the inside of most of the buoys, cutting right in for the turn buoys. The drone they had flying overhead kind of freaked me out a little as it was right at the edge of my vision during each stroke, hovering. The swim got a little choppy at the turn buoys but coming back was fast. Some of the fast swimmers in the wave behind me began catching up so I did my best to draft with them. Goal Time: 1:04:28 Actual Time: 1:06:11 Putting my goal times here for educational purposes. Colin had me write up a race report a week before Tremblant as if I had already finished (for fun I’ll link it at the end of this report). Great exercise for everyone to do in terms of visualization and goal setting. But always remember that race goal time is essentially meaningless as race day can bring ridiculous conditions (hell0 LP 2014!). 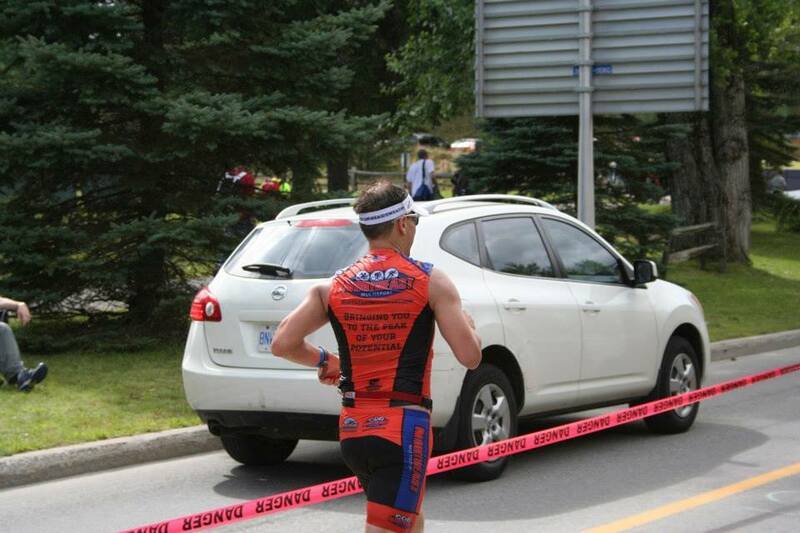 So I was going by feel on the swim, power on the bike, and pace on the run (kind of, more on that later). Transition at MT is long – and no red carpet like they had for the half, oh well boo hoo. So the bike! I really was looking forward to it as I’ve been feeling strong on the bike this season. Heading on the first of four rides on Monte Ryan and I was ready. Somewhat windy out on highway 117, felt great on the hills. Back onto Monte Ryan and up to the casino hills, I was always keeping the power in check as it’s very easy to overdo it in this section of the course. I had some motivation to keep going strong as not too far behind me was A LOT of bikers, and I didn’t want to get caught in any draft packs. Second loop much like the first (by design) feeling it a bit on the casino hills. Goal Time: 5:22:35 Goal Power: 185 watts Actual Time: 5:30:37 Normalized Power: 180 watts (close) Variability Index: 1.09 (it’s a hilly course right 😉 Avg Power: 165 watts Avg Heart Rate: 147 (nailed it here) Avg Speed: 20.33. A little slower than I was anticipating but all the numbers I was tracking were pretty much right on – yes! Well, here is where the race really begins. Had to take a quick pit stop in transition and was excited to try out my new Hoka shoes. Began the run, banana and gel in hand and noticed my watch was not getting any satellites, and proceeded to continue with the same. It was a bit interesting figuring out my pace at this point as the course is marked in kilometers only, so I pretty much took my pace at each 5k – which actually worked out pretty well. The previously mentioned Hokas were fantastic, I literally felt like I was floating, and it wasn’t the delirium talking (I think). So with no solid pace measuring tools, I relied mostly on feel and HR. Important lesson, have a backup plan, visualize things going wrong as they inevitably will in IM. The run was even, a little slow down at the end, but other than that, I felt great – every familiar face giving me an added boost. Goal Time: 3:32:14 Actual Time 3:36:45 Pace 8:16 Avg HR 156. Very happy with the run as it has been my achilles heal this season. Yes, stuffing my face, typical. So in the end, I got exactly what I put into racing this season, hit the important marks, and had a great IM race. Remember in IM, there is no luck, there is no finishing beyond where you have put the effort in. There is a million opportunities for failure and and you’re going to have many during the course of the race, anticipate, plan, and execute! 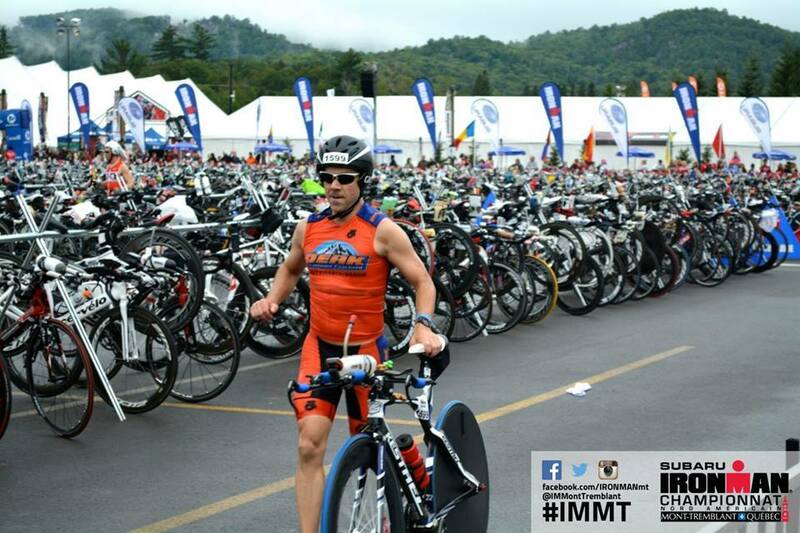 Looking forward to a second chance at IMMT in 2015 with many NEMS folks to train and race with. Thanks Colin and Leslie for the coaching, like I always say, coach needs a coach. And a special thanks to all of my coached athletes, having you look to me for guidance was extremely motivating for me and kept me going this season. And my fellow NEMS MT athletes, what a blast!!! Can’t wait for next season, now for a little cyclocross, some half marathon PRs and many sure to be super exciting hours on the trainer.